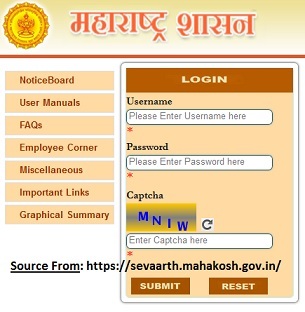 Procedure to get Maharashtra Mahakosh Employee Salary Pay Slip Download at Sevaarth.mahakosh.gov.in web portal…. Maharashtra state government has come up with new and differ website portal. It was established and officiated by the National securities Depository limited (NSDL) department. Basically dealing with government employees salary slips and also matters to do with pensioners. This one way to cater for the employees as they won’t have to visit department heads for salary statements. The portal is accessible to all and present throughout. It is simple to use by use of password and correct credentials. Here the workers can get all their personal details about their salaries and one can be sure of safety as nobody can access your account. Maharashtra government is trying to eliminate the paper work and let everyone go digital. It eases the work for both the government and the workers. No corruption cases and lost information since the commencement of the website. In deeper sense Sevaarth portal was formed to help in automatic operation for all the department officers of the bigger Maharashtra government. Sevaarth is considered to be important by bodies like the IFMS, BEAMS and so many others. This the pioneer program of the government to go paperless and embrace technology. The system is attached to other 5 module which will discuss below. Payroll: As the name depict this module deals with salary preparation for all the government workers in the state. Niwruttivetanwahini (Pension): The term talks more on pension, this is used for pension preparation. This for the retired government employees. The government has a set age for the workers to retire. However they have to pay the employee on monthly basis. They money is sent to their pension accounts. One has to be under the Maharashtra government as you retire. DCPS & NPS: this a module for employees under the DCPS&NPS scheme. It is usually for the account maintenance and submission of the employees. Loans and Advances: This a section which checks matters of loan and advances given to the state government employees. They also check on the payments and how to recover back the funds in order to disburse to other employees. There are set rules for one to qualify for the loans and advance funds. What is Mahakosh? This an official website page which was established by the Maharashtra government. The link contains other official website links which serve different function under the government. Most of the links deal with financial matters of the government and their workers. Sevaarth link, GRAS and many others are under this bigger link. It proper to note the Sevaarth website is only available for the first 10 days of the month. The section of the DDO and the assistant is always available using their login details. The employees can see the form 16, GPF statement, NGR schedule and the DCPS R3 slip. All this are under the employee corner. The DDO and DDO assistant have the right to access the employees’ corner using their login credentials. The website is secure and no one can access the employees’ corner without their details. The employee can view their salary slips and also download or print them for personal purpose. They have to enter the right details for the system to work. Below we have a guide of how one can download the salary slip. On the home page the employees need to login to their account. When the page opens click on notification tab. Here select the employees’ pay slip. Fill in the mandatory details on the sections. Recheck all the information then click submit button. In few seconds the slip will show on the screen check the details. If satisfied you can print or download the salary slip. Note you have to keep updating your contact and personal details in order to get new notification of the site. How to create a DDO office? First key in the name of the DDO office. On the menu bar you need to select the DDO office by indicating using Y/N. Y showing it’s a DDO office. After this now select the state which is Maharashtra. Choose the district, Taluka, town and village. Now choose the Y if the area is on the hilly area. You have to select the office city class. Enter the telephone numbers they should be two. Enter the tribal area Y this to indicate the office is at a tribal area. Key in the fax number. Now enter the email address. Check the details again and then save all the information. Note the Y means the DDO office is located to that area but the N means the DDO offices is not place in the area indicated. This new site or utility which is meant for the employee and under the Sevaarth site. A place where the employees can access their details. They can generate their pay slips and pension details. The employee who should be a government worker should have the Sevaarth ID. With this the pay slip will be generated without visit the HOD offices for statements and salary slips. Enter the password and the user id. When you login go to the employee corner and select the pay slip. Key in the month and the year which you need the pay slip. The system will generate and display it on the screen. Now you can print the slip or download for future reference. Importance of the sevaarth.mahakosh.gov.in portal? Saves time for both the government department heads and employees. Taking all the government working standards to a digital level. It is easy to use as you can apply for travel and medical funds. All the payments like GIS are easily done. You can access the website anytime using the login details. One doesn’t have to worry of the papers getting lost. The information saved in the serves can be accessed anytime. The system is updated regularly thus helping the employee know what is new on the website. No long queue and waiting for department leaders to confirm your pay slip or pension. Very secure s no information is leaked out. It okay to note the DDO office can access the employee corner, this still makes your account safe as they update and remove what is not necessary. The portal is open to all and if you forgot your password this should not worry you. On the same website page https://sevaarth.mahakosh.gov.in fill in your details and then select the forgot password tab. The system will send you an OTP on your registered contacts. Use the OTP as temporary password to set the actual password. Set a strong but easy to remember password.